James Herbert Billen was born in Mudford, just north of Yeovil, on 23 August 1886. He was the son of thatcher Samuel Brine Billen (1861-1909) and Emily Tabitha née Bicknell (1861-1941). In the 1891 census Samuel and Emily were listed living in Mudford with four-year old James, listed as a scholar, and his two-year old sister Susannah Gertrude, known as Gertrude. The family were at the same address in 1901 and at this time 14-year old James was working as a carpenter's apprentice. In 1909 Samuel Billen died and Emily moved her family to Yeovil. In the 1911 census they were living at 4 Alexandra Road. James was now working as a leather slaker with Blake & Fox and his sister was a shop assistant. At the beginning of 1913, at Yeovil, James married Hilda Maud M Gard (1885-1959). James and Hilda set up home at 42 Percy Road, later moving to 17 Mount Pleasant, Newtown. A member of the Yeovil Corps of the Salvation Army, James was also a member of the Salvation Army band (see Gallery). James enlisted during early 1917, although the exact date is not known. He joined the Royal Naval Volunteer Reserve as Able Bodied Seaman R/251 in the 63rd (Royal Naval) Division. This was a United Kingdom infantry division originally formed as the Royal Naval Division at the outbreak of the war, from Royal Navy and Royal Marine reservists and volunteers, who were not needed for service at sea. Following many losses among the original naval volunteers, the division was transferred to the British Army as the 63rd (Royal Naval) Division. The eight battalions were named after naval commanders, Drake, Benbow, Hawke, Collingwood, Nelson, Howe, Hood and Anson, later being numbered from 1st–8th. As an Army formation, it fought on the Western Front for the remainder of the war. James was a member of 2nd Brigade's 6th (Howe) Battalion and was sent to France around February 1917. At this time his battalion was fighting a series of actions known as the Operations on the Ancre that lasted from 10 January until March 1917. After the Battle of the Ancre (13–18 November 1916), British attacks on the Somme front were stopped during inclement weather and until early January 1917 military operations by both sides concentrated on surviving the rain, snow, fog, mud fields, waterlogged trenches and shell-holes. British operations on the Ancre from 10 January to 22 February 1917, forced the Germans back five miles (8.0 km) on a four mile (6.4 km) front, and eventually took 5,284 prisoners. On 22/23 February, the Germans fell back another three miles (4.8 km) on a fifteen mile (24 km) front. It was during this period that James would have arrived on the Western Front. The next major action in which James was involved was the Second Battle of the Scarpe (23-24 April 1917), a phase of the Arras Offensive. At 04:45 on 23 April, following two days of poor visibility and freezing weather, British troops of the Third Army attacked to the east along a nine mile (14 km) front from Croisilles to Gavrelle on both sides of the Scarpe. On the left of the main British attack the 63rd Division, including James and the Howe Battalion, made rapid progress against Gavrelle and secured the village. Several determined German counter-attacks were made and by the morning of 24 April, the British held Guémappe, Gavrelle and the high ground overlooking Fontaine-lez-Croisilles and Cherisy. Initially James was reported as missing but it was later confirmed that he had been killed in action during the capture of Gavrelle on 24 April 1917. He was aged 30. In fact James was just one of thirty-three men of his battalion killed that morning and in total the capture of Gavrelle cost the lives of 192 men of the Naval Division. In its edition of 25 May 1917 the Western Gazette reported "Private J Billen, of the R.N.D., is reported as “missing” whilst serving in France. The news was conveyed by a chaplain, who, in a letter to the wife of Private Billen who resides at 42, Percy Road, expressed the sincere sympathy of the men of the Company with her in her time of deep suspense, and trusted that the news of his safety would soon be received by her. Private Billen is held in high esteem by many friends. Sympathetic allusion was made to the sad event at the Salvation Army Temple, on Sunday, Private Billen, prior to enlisting, being a member of the band. He was formerly employed by Messrs. Blake and Fox as a slaker, and had been in France about two months." In its edition of 14 December 1917 the Western Gazette reported "Mrs H Billen, 42 Percy Road, has received the official notification, from the Record Office of the death in action of her husband, Able Seaman JH Billen." 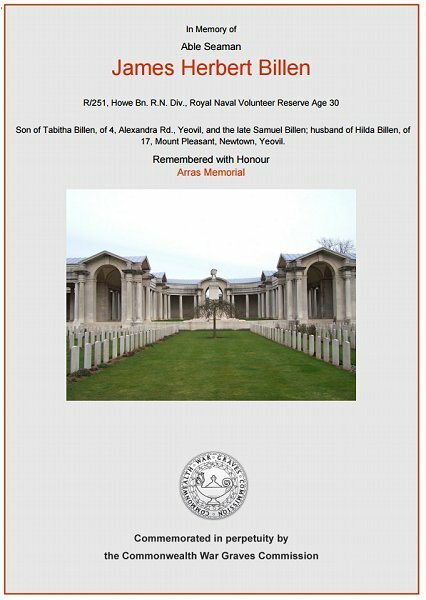 James Billen is commemorated on the Arras Memorial, Bay 1, and his name is recorded on the War Memorial in the Borough. 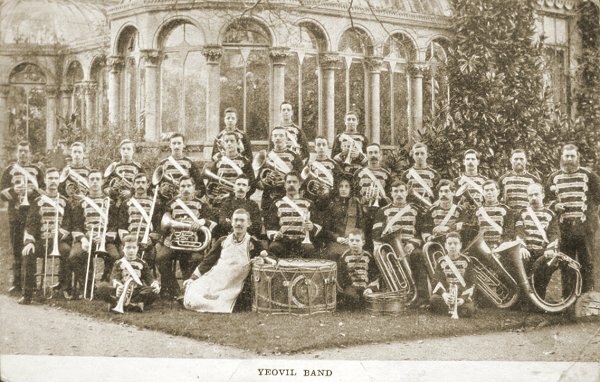 A postcard of the Yeovil band of the Salvation Army dating to around 1910. James was a member of the band and is probably in this photograph. The Commonwealth War Graves Commission's certificate in memory of James Billen.